RightCapital's Budget tool empowers your clients to simplify life with better visibility, all in one platform. No more multiple log-ins! Invite your clients to the Client Portal and begin changing their financial future by making better spending choices today. 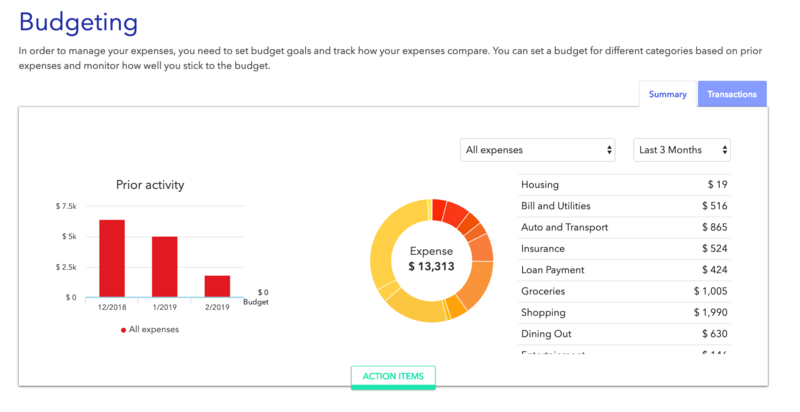 To access the budgeting tool in RightCapital, navigate to the client and select Dashboard > Budget. Activate the powerful budgeting tool in RightCapital by using account aggregation today! The Budgeting tool enables active management client expenses — by you, the advisor, and by the client through the Client Portal. Transactions are loaded from linked accounts and categorized. View the entire budget or individual categories by selecting the drop-down menu on the Summary page (default is "All expenses"). Set a budget number for each of the categories in order to allow clients to compare actual expenses to the budget, either in aggregate or per category. Select Action Items to update budget parameters. The "Last 3m" category reflects the average total transaction amounts for that category for the past three calendar months. You can update the budget numbers either using the slider bar or typing the value into the text box. When an account is initially linked, RightCapital will import the past three months of data associated with that linked account. Your clients may choose to share the details of transactions with you. If so, select Transactions to see all of the transactions supporting the budget information. Filter by account, category, or time period. Change an assigned category by mousing over the category name for the transaction you want to change and using the drop-down box to select a new category. 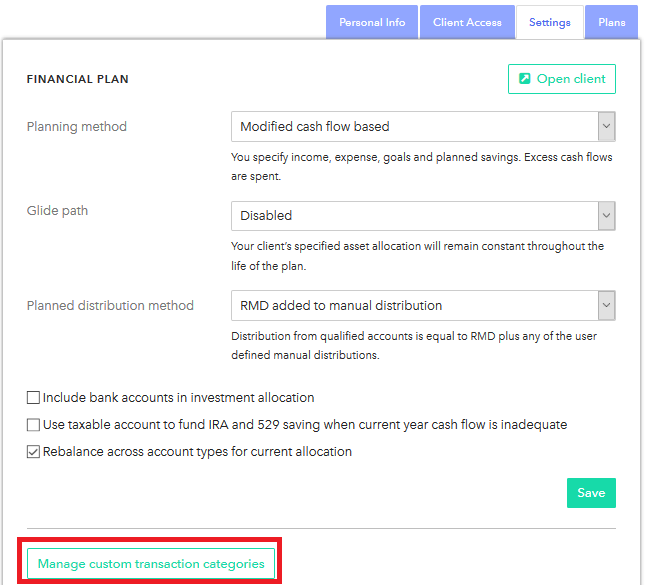 Once a category has been changed, any future transaction that comes in with the same description will be automatically categorized to the new category. 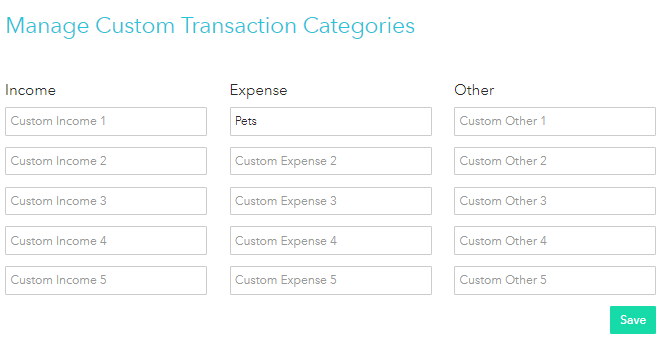 Transactions categorized as "Other" are not considered expenses. If expenses appear to be missing from the budget, double-check the "Other" category -- the transactions may simply need to be re-categorized to appear as an expense. Clients can grant you permission to access the Transactions tab. To do so, have your client navigate to ⚙️ > Security > Permissions in their Client Portal. If the client un-checks the box shown below, you will be able to see the Transactions tab. For each portion of the transaction, specify the description, category, and amount. The sum of the amounts entered compared to the total amount of the transaction will display in the lower right of the tab to be sure the splits add to the total transaction amount. Click the "+" button directly above the "Save" button to split the transaction into additional pieces. To save a transaction split, select Save. To revert back to the original transaction information, select Unsplit. Once you click on 'Unsplit', you will not be able to get back to the split transaction details you have entered and may need to re-enter those details if a split is once again required. Once a client has linked one or more bank/credit card accounts, there is also an option to add in manual transactions. In order to post manual adjustments to budget line items, a manual account is required. All linked accounts import all line items automatically; to generate a new (and manually entered) line item, do so once a manual account is created. Add a manual bank or credit card account on the Profile > Net Worth screen. Click Add Account button and choose Bank or Card. Selecting + Transaction will bring up a pop-up box to enter the Date, Description, Category, and Amount. Please note that negative numbers in the Amount field represent expenses and positive numbers represent income/additions. Once the transaction has been saved, it will show up in the transactions list like any other transaction. You can delete a manually added transaction by clicking on the 'X' to the right of the transaction information. Select Manage Custom Transaction Categories to add or edit additional categories for that client. Enter the name of the category under the appropriate column and select Save. When the Budget screen for that client is accessed, the new category will be displayed. Transactions will not be automatically categorized to the new categories — you or your client will have to re-categorize transactions in the Transactions tab. Custom categories are currently limited to five additional categories under each of 'Income', 'Expense', and 'Other' sections.